Will your online business actually be able to keep up with increased demand and the increasingly less forgiving expectations of your users when your big event season occurs? If you’re not sure, or even if you think you are, this brief guide and check list can help you as you head into your peak online period. This guide summarizes feedback from hundreds of leading companies that we’ve worked with and creates what most would consider a “survival guide” for any big season or peak online event. The ultimate goal is high conversion rates, followed by implementing changes based on lessons learned post-event. 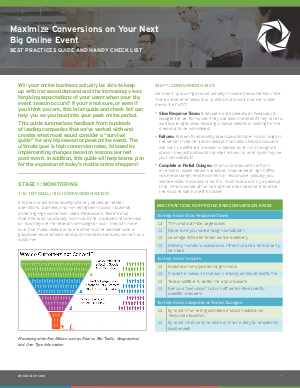 In addition, this guide will help teams plan for the explosion of today’s mobile online shoppers!